"Come along Diedre. We mustn't watch the SinEater work." Exorcists have the unenviable task of dealing with the most evil and vile entities imaginable. SinEaters share that job description to some extent and those with the task in older times were forced to reconcile their work with the public's perception of their work. All of that is on display in SinEater #1, published by Insane Comics. The issue is written by Jojo King and illustrated by Chase Dunham. Cassandra is an orphan. No family and no friends. Nobody to care for her except for an old homeless man names Potnik. Unfortunately, Cassandra is also the village's designates SinEater. She is tasked with the burden of consuming the demons and evil inside every person crossing over to the next life. Cassandra is afraid. It is becoming increasingly difficult to bear one one of the heaviest burdens of all upon her shoulders: living with the sins of others. 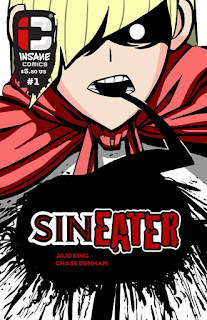 SinEater #1 offers a pretty intriguing concept wrapped in a somewhat formulaic tale. King does a good job of introducing Cassandra and setting the tone for her world; a world where hers is a thankless job that instills more fear than adoration. Things take a towards the end of the issue and that's the really captivating part, as King ensures that Cassandra's role continues to be thankless. The formulaic aspect plays out in the sense that there's a clear protagonist in Cassandra, clear antagonist in a priest and an ally in Potnik. In this regard, King's plot is relatively simplistic, which isn't a bad thing per se, but the concept behind his book is actually quite interesting that it feels a little betrayed by the relatively straightforward storytelling. The atmosphere in SinEater #1 is emboldened by Dunham's equally straightforward art style. The book is awash in blacks and whites, evoking a sentiment akin to that of a Twilight Zone episode. Dunham's characters boast anime inspirations and it's arguable that the entire issue has a manga feel to it (save for the reading direction). The art boasts an affability to it that makes it very approachable for fans of all-ages--even if the content is a little on the mature side--and Dunham doesn't bog it down with an abundance of gore or violence. The characters in the book clearly have "demons" to contend with, even if the presentation of that evil isn't done with an emphasis on fear-inducing character models. SinEater #1 is a strong first issue with a few minor flaws. Cassandra is a character who's tired of being the vessel for everyone else's evil, but when she takes her anger out at an inopportune time it makes things more difficult for her. King's story is pretty predictable, but the underlying premise is sound and the main players promise to have some interesting interactions amongst them. Dunham's art is very clean and efficient, fostering an eerie atmosphere for a SinEater such as Cassandra to work in. SinEater #1 is a promising start to a series and boasts an originality to it that will likely appeal to plenty of readers. SinEater #1 is available now.